THIS IS A NEW FULL GRAPHICS SET IN WSR. LOOK GREAT ON BLACK, RED OR WHITE PLASTICS. 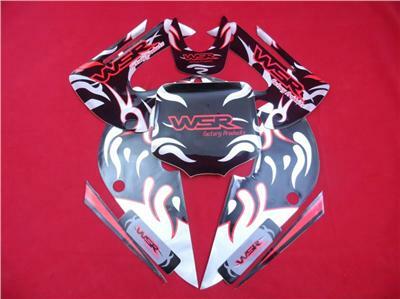 YOU GET 2 TANK PANEL GRAPHICS, 1 FRONT NUMBER BOARD GRAPHIC, 1 FRONT MUDGUARD GRAPHIC, 2 REAR NUMBER PANEL GRAPHICS & 1 REAR MUDGUARD GRAPHIC. THE GRAPHICS ARE ON 3M BACKING SO ARE A GOOD QUALITY. BEST TO FIT THESE IN DRY WARM CONDITIONS. THESE ARE FOR KLX STYLE CHINESE BIKES ONLY LIKE THAT IN THE 3RD PICTURE. 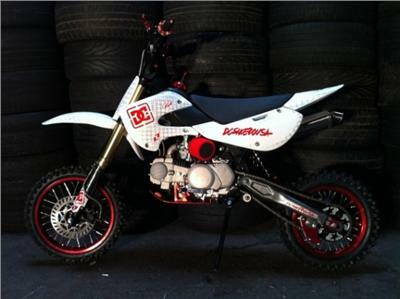 BE CAREFUL AS BBR LOOK THE SAME BUT THE REAR PANELS ARE HALF THE SIZE OF THE KLX. IF YOU ARE UNSURE OF WHAT MODEL OF BIKE YOU HAVE YOU CAN EMAIL A PICTURE OF IT TO[email protected] AND WE WILL LET YOU KNOW.